CLEMSON, S.C. — The Atlantic Coast Conference announced its annual All-ACC Academic Team on Wednesday, with members of Clemson's 15-0 national championship squad accounting for seven selections. Clemson's seven All-ACC Academic Team selections are tied for the second-most in a season in school history (seven in 2009) and are one shy of the school record set by the 2017 squad (eight). Clemson has now had at least three All-ACC Academic selections in 12 consecutive seasons. 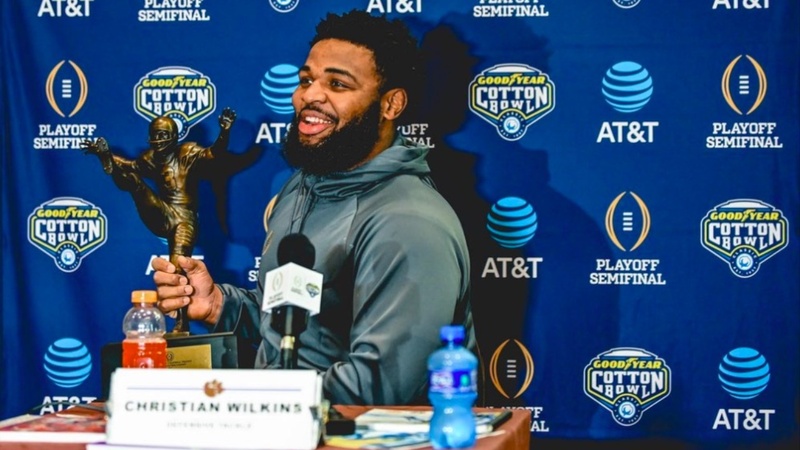 Defensive lineman Christian Wilkins, who became the first player in school history to win the William V. Campbell Award, known colloquially as the "Academic Heisman," earned his fourth career All-ACC Academic selection. He joins center Dalton Freeman (2009-12) as the only players in school history to be placed on the team four times. Joining Wilkins as repeat honorees are offensive linemen Justin Falcinelli and Sean Pollard. Both Falcinelli and Pollard appeared on the 2017 All-ACC Academic Team and are now two-time recipients of this honor. The selections of running back Adam Choice, quarterback Trevor Lawrence, linebacker Kendall Joseph and wide receiver Amari Rodgers all represented their first career All-ACC Academic honors. All seven honorees were ambassadors with Clemson's P.A.W. Journey program, which cultivates leadership in football student-athletes through personal growth, life skills and professional development.